Organic Pesticides: Not An Oxymoron : Shots - Health News A recently released report on pesticide residues found that about 20 percent of organic lettuce tested positive for pesticides. How could that be? We talked with the University of Minnesota's Jeff Gillman about the state of organic farming. 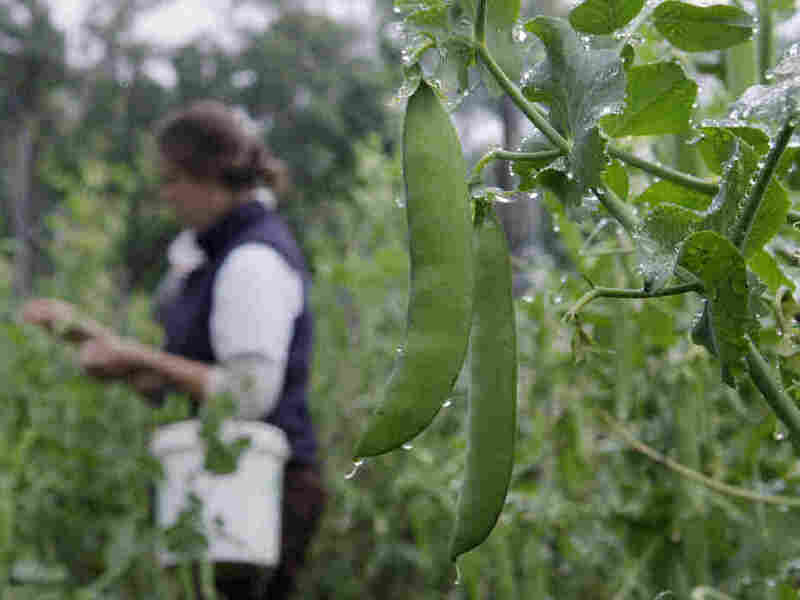 Sugarsnap peas are ready for harvest at the Many Hands Organic Farm in Barre, Mass., in the summer of 2009. When people are buying organic food, they often make the incorrect assumption that there are no pesticides. It's true that organic production often uses fewer dangerous chemicals, but certain pesticides are allowed. It turns out that a key factor in chemicals being cleared for use on organic crops is whether they occur naturally. Spinosad, for example, comes from the soil bacterium Saccharopolyspora spinosa. It can fatally scramble the nervous systems of insects. It's also poisonous to mollusks. The USDA maintains an official list of substances that can and can't be used for organic farming. Other potent natural extracts that have been approved for use as pesticides include pyrethrin, derived from chrysanthemums, and azadirachtin, from the Asian neem tree, which was also detected on some samples of organic lettuce. All three of these substances are considered slightly toxic by the EPA. Synthetic compounds can also make it onto the list as pesticides, if they are relatively nontoxic combinations that include minerals or natural elements, such as copper or sulfur. But some naturally occuring substances, such as nicotine and arsenic are off limits. Are naturally derived pesticides less toxic than synthetic ones? The answer depends a lot on the dosage, says Gillman. "To control fire blight on the same acre of land," he explains, "I could use a tiny amount of a potent synthetic that has proved safe over the last 50 years, or a much larger amount of an organic pesticide." He demurs on saying which is better, saying, "I want people to know that there are definitely tradeoffs." In the USDA tests, there was ten times as much spinosad on organic lettuce than was found on conventionally cultivated fruits and vegetables. It's a relatively new chemistry, relatively safe, and extremely effective against some pests. Now, if I heard about high levels of copper being detected, I'd be more scared than for this stuff. Copper compounds are used to fight fungal and bacterial diseases in plants. Copper isn't very toxic to humans, he says, but it can accumulate in the soil and eventually become poisonous to plants and even worms at high concentrations.